Epic is investigating a stability issue. 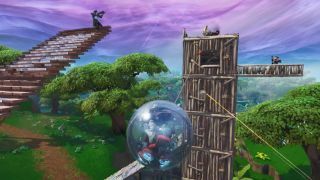 Fortnite's latest injection of whimsy, a giant hamster ball with a grappling gun, has been temporarily removed from the game. The Baller was disabled earlier today, with Epic saying that it was investigating a stability issue via Twitter. There's no word on when it will return. It might have something to do with the Baller's impressive ability to fly across the map. Reddit user Peridium posted a clip of the exploit (cheers, Gamespot), which sees the Baller get launched up into the air by a lavafall, letting the player boost their way across the skies, avoiding any gun-wielding pests below. It takes them around 30 seconds to get all the way to the other side of the map. The Baller is meant to be very mobile, rolling around faster than players on foot and able to use its grappling gun to climb and swing, but not that mobile. Other players have reported bugs, including an issue with players dying when they leave the Baller after landing a jump, as if the fall damage is being retroactively applied. Reddit user bbjared7 posted a video of the bug killing them. Nobody should be forced to use their legs—I only use mine to flee from wild animals—so the loss of the Baller, even if it is just temporary, is a tragedy. A lot of Fortnite players disagree, however, and have expressed their desire for it to never return. The same thing happened with the planes, the Infinity Blade and most of the fun but not exactly balanced additions the game has seen. The Infinity Blade was eventually vaulted, but then it returned in a limited time mode. There's no reason to believe Epic won't just put the Baller back in the main game when it's fixed, however.